Volcano: A Fiery Tale of Survival | Thomas Kingsley Troupe — Writer. Filmmaker. Action Hero. When Cam’s family decides to go to a luau during their vacation in Hawaii, he decides to stay behind to play some video games in the hotel. Lost in gaming euphoria, Cam slowly begins to realize that the rumbling noises aren’t coming from the TV–the entire hotel is shaking. Cam glances out the window of his hotel room just in time to see the nearby inactive volcano explode. Chunks of rock and lava cascade down into the city. Giant, flaming rocks start to tear the hotel to shreds. 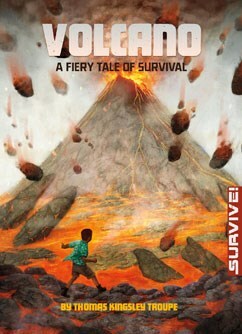 Cam knows he needs to find his family and get out fast, but a river of lava runs between him and his loved ones . . .